My wife funded my purchase of a new camera for Christmas, and I bought it today. It's a Canon PowerShot SX 260 HS (no, I haven't a clue what "SX" and "HS" mean), a handy point-and-shoot that will be easy to carry and use on my morning walks. By the time I'd set it up and the lithium ion battery was charged, it was dark and sleeting outside. So my first practice shots were of two handy subjects in our apartment. 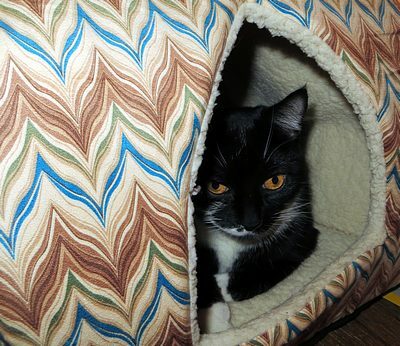 In the photo above, Hepzibah is snug in her kitty bed. I bent down to try to get a better shot, and, of course, she got up and left. 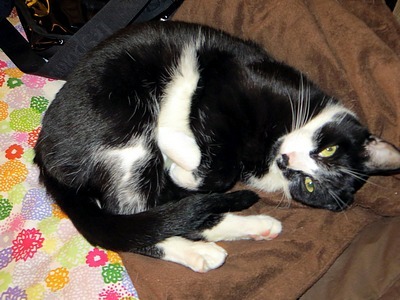 Here's Attila ("Tilly") curled up on our bed. 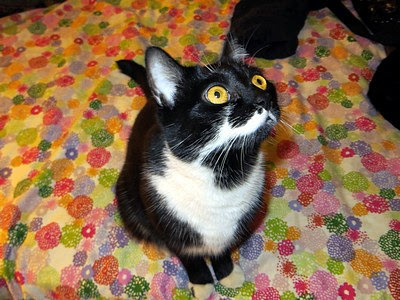 Is that a bug on the ceiling? The weather should be better tomorrow, so I'll try to get some outdoor shots. Anything good I'll post here. 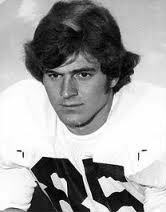 Remembering Peter Demmerle, and anticipating Alabama vs. Notre Dame. I used to hate Notre Dame. This came to a climax with the 1992 Sugar Bowl, in which the third ranked Florida Gators, my favorites, led by Heisman candidate QB Shane Matthews, played the eighteenth ranked Fighting Irish. Florida was a heavy favorite, and I saw this as their big opportunity to crash into college football's elite by beating a team that epitomized the game's establishment. Over time, I had become sick and tired of the panjandrums of pigskin punditry going on, as I once put it, like a minyan of Reb Tevyes chanting Knut Rockne, tra-DI-shon! ; Four Horsemen, tra-DI-shon! ; Golden Dome, tra-DI-shon! ; subway alumni, tra-DI-shon! ; ad nauseam. Much to my dismay as I sat at the Lion's Head bar that New Year's Day afternoon, tra-DI-shon was to prevail, as usual. The game started well for me, with the Gators holding a 16-7 lead at halftime. In the third quarter the Irish got a quick TD and field goal to go ahead 17-16, but Florida responded with another FG to regain the lead, 19-17. The final quarter proved really ugly. Florida's Arden Czyzewski notched his fifth three pointer to build the lead to 22-17. Then the ND offense went to work, propelled by the running of Jerome Bettis, later to become one of the NFL's leading rushers and gain the nickname "The Bus." His two quick TDs, one followed by a two point conversion, put the Irish ahead 32-22. Florida scored again on a Matthews to Harrison Houston pass; a failed conversion made it 32-28. But Bettis went back to work, breaking loose for a 39 yard scoring run that iced the game at 39-28 with less than two minutes left. I chugged what was left of the last of a series of beers I'd had during the game, paid my tab, and left before the post-game commentators could break into their Tevye dance. * Some time after that I offered Peter Demmerle (photo) my grudging congratulations. I had known Pete, a rising star at LeBoeuf, Lamb, my law firm alma mater, for several years. I knew he had played football at Notre Dame, and would occasionally make friendly wagers with him on games in which I thought the Irish might be upset. He always won. In 1989 undefeated Notre Dame and West Virginia teams were slated to play for the national championship at the Fiesta Bowl. I offered to bet on the Mountaineers; Pete's response was, "You really want those guys to win? How about if they do I beat you up?" I was saved by a 34-21 Irish victory. Our conversations weren't always about football. We both worked in the same area of law: insurance transactional and regulatory matters. Pete was instrumental in planning the restructuring of the Lloyd's of London insurance market in the 1990s. One day in 1999 or 2000 I ran into Pete on a Midtown street around noontime, and stopped to chat. I noticed that his speech seemed slurred. From another friend I learned that he had been diagnosed with amyotrophic lateral sclerosis, "ALS" or "Lou Gherig's disease." He died in 2007, leaving a wife and four daughters. During his final years, he supported and advocated ALS research. While I knew Pete had played at Notre Dame, I knew nothing about his career there, since I never followed the team except when they were playing someone I hoped might beat them. I once asked him what position he played; he said he was a pass receiver. Since nothing was said about an NFL career, which would have to had been quite brief considering his having spent three years in law school, then gone through the lengthy apprenticeship of being a law firm associate before being made a partner, I guessed he was a second stringer who spent much of his college career warming the bench. I was wrong. Thirty-nine years ago, there was a college football national championship game arranged not by computer rankings or a rubric of poll results like this season's Alabama-Notre Dame matchup for the Bowl Championship Series title, but by the kind of primitive challenge heard in a sandlot. The game had historic dimensions. It was the first meeting of two of college football's dominant teams, and it had the north versus south angle. Despite this, I have no memory of it. I may or may not have watched. I didn't have any rooting interest, as I disliked both teams, Notre Dame for the reasons given above, and Alabama because they were a frequent nemesis of the Florida Gators. Nor was I a fan of the stern, authoritarian Bear Bryant, although I did get a chuckle from one of the several motivational signs he was said to have posted in the training room: "A moral victory is like kissing your sister." Having no sister, I could only use my imagination. If I did miss the game, I missed a good one. Indeed, it's hard to fathom how I could have forgotten it if I did see it. If you watch the clip above, you'll see what an important part Pete Demmerle played in Notre Dame's victory, with his pass receptions setting up the first TD and his catch for a two point conversion that later tied the game. Doing research for this post, I learned why Pete didn't have a successful NFL career, despite having been a college All-American. The championship Sugar Bowl game was during his junior year. The following year, Alabama and Notre Dame met again, though not with a national championship at stake, in the Gator Bowl. During that game, Pete suffered a knee injury that, while not severe enough to preclude his playing again, was sufficient to drop him to being a thirteenth round draft choice. He chose law school instead. So, on the night of Monday, January 7, I will be watching the BCS championship game, once again pitting Alabama against Notre Dame. This time, with apologies to my friends from the Heart of Dixie, I'll be backing the guys in the gold helmets, thinking (maybe even yelling) "Win one for Pete!" Maybe I'll even discover my inner Tevye. *This brings to mind Super Bowl III, which I watched in the room of my law school classmate, the late Michael Francis Vincent Peter Vaccaro, owner of the only TV on my dorm floor. The moment the game ended, Mike jumped up and turned off the TV. Asked why, he said, "I couldn't stand to hear Howard Cosell say, 'Broadway Joe Namath, the New York Jets, and the American Football League all came of age today.'" My last post pointed to the tragic side of Christmas: Herod's massacre of the innocents. This is a carol that by contrast commemorates the kind deeds of a good king, actually a Bohemian nobleman posthumously raised to kingship by the Holy Roman Emperor Otto and canonized by the Roman Catholic Church. Although Wenceslas lived in what is now part of the Czech Republic, the lyrics of the carol were written in mid nineteenth century England and set to a Finnish tune. The city of Coventry, in the English Midlands, suffered its own massacre of the innocents on November 14, 1940, when a Luftwaffe firebomb raid killed over 800 people, injured thousands, destroyed 4,000 houses, and reduced historic Coventry Cathedral to a shell.